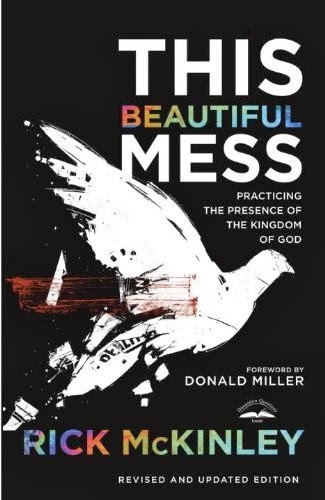 I went through three phases reading This Beautiful Mess: Practicing the Presence of the Kingdom of God by Rick McKinley. From the concept, I really wanted to read it and like it, and coasted on that like a pretty fair ways into reading it. But at some point during the reading, I shifted to really wanting to not like the book. This has much more to do with me than the book, but we’ll get to that in a second. Ultimately, however, despite my best efforts, I never fully made it to dislike, and finished the book out liking it so much that I immediately ordered a copy to give as a gift. Much of the focus of the book is something that I believe firmly — that Christians tend to focus way too much on the next life to the point of mission the importance of this one. We have a habit of picturing “the kingdom of God” as this place we go when we die with streets paved with gold, rather than a real and immediate kingdom that is truly at hand. And this part of the book, I wanted to and did like. For those unfamiliar with the concept of a real and present kingdom of God, the book may well be eye-opening. For those doing their best to live it, the book is a refreshing reminder that other people are doing the same. And that’s the trick — it’s one thing to go around and blissfully know that you’re living in the immediate kingdom of God, it’s another to roll up your sleeves and get in the trenches of an alien kingdom in this material land. And thus the part where I wanted to dislike it — it turns out, the book argues, it’s not enough to just go around saying, “yep, Kingdom of God.” You have to love. You have to care. You have to work. You have to GIVE. I wanted to disagree. I wanted to find a loophole. I wanted to find a way not to shoulder that obligation. But ultimately, I couldn’t. And when I made peace with that, I was able to like the book again. I’m not saying that I’ve fully changed my life based on this book, but I’d like to think I’m at least more aware of what practicing the presence of the kingdom of God really means.